Cane Bay Partners, created and domiciled in the United States Virgin Islands, was formed for the express purpose of extending our consulting activities to our clients as an EDC approved company. We currently enjoy contracts with a variety of clients who have recognized the value of the services we provide and currently enjoy the improved business results because of the implementation of our recommendations. Our management consulting practice possesses long-term agreements with a variety of global companies. 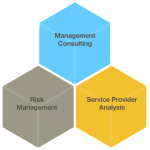 For our clients serving the financial services industry our focus is the development and the implementation of our risk management protocols and process improvement consulting. Our collections clients seek assistance in the area of collections modeling and analytics, predictive dialer utilization, debt sale strategy, and compliance. And our portfolio clients enjoy services ranging from cash management and tax planning to investor relations and compliance. Our portfolio management practice is traditional in nature and provides accounting, cash management, compliance, investor relations, and tax planning services. Traditionally considered “back office” functions our services are similar in nature to those developed for hedge funds and include: daily, weekly, monthly reporting; general ledger, partner allocation, and draft K-1’s; management and performance fees; as well as various customized operational and financial reporting activities, which assist our clients with producing results that exceed the results of their industry peers. Understanding and assessing risk is a fundamental component of business in today’s competitive environment. 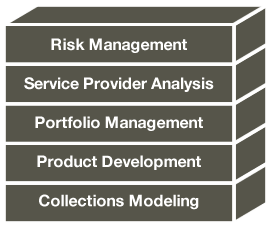 Our partners, highly skilled in risk management modeling, statistics, and underwriting, have mastered this complex art to the benefit of our clients. Routinely clients task us with analyzing complex questions associated with the risk factors within their business, and rely on our team to quantify the associated risk, as well as the means to mitigate the risk. Additionally, as a result of our depth of client understanding, it is not unusual for our team to recognize a need within a client company, thoroughly research that area, and simply present the findings to our clients. This type of thought-leadership assists us in forming extremely close ties with our clients and is primarily what differentiates us from our competitors. We also focus on new product development and these products range from credit scoring models to new financial services products; collection scoring models and debt liquidation products; to automated underwriting products, all of which allow our clients to better serve their respective customers. In one instance, we developed a lead consortium for lead generation, which allowed us to increase lead volume and quality for our client. In addition, we have analyzed international markets for product expansion on behalf of our clients that included market and product analysis. For instance, we evaluated new product expansion into the United Kingdom by analyzing its competitive landscape, and regulatory environment. At the conclusion of this comprehensive study, it was determined that we should proceed with the licensing process, which we also successfully accomplished. Our service provider analysis practice focuses primarily on more contemporary means and utilizes cutting edge online methodologies. Our services span the spectrum from customer acquisition strategies, customer retention strategies, and a high-level of service-oriented approaches to existing client customers. 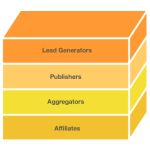 Our expertise in forming strong relationships with online lead generators, publishers, and aggregators allows us to provide added-value to our clients in the form of cost savings, improved positioning with these vendors vis-à-vis client competitors, and ultimately profitability. We provide not only excellent underwriting and credit modeling for our clients, but also excel in providing models, which are highly predictive of clients’ defaulting customers. Through our services our clients are able to quantify which customers are more likely to repay based upon our multi-variant analyses of their default data. These models assist us in advising them of which accounts are more collectible, which should be sold and at what number of days in the delinquency cycle, as well as sale price advice. 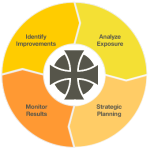 Looking for management consulting services that can deliver improved business results? Please contact one of our representatives today.